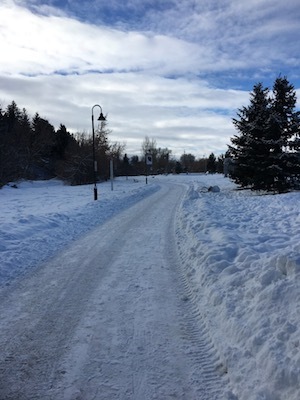 The Gallagator Trail is the signature multi-use path in downtown Bozeman, running from E. Main St. south for 1.7 miles to the Museum of the Rockies. It’s a lovely, flat trail passing through Lindley Park, Burke Park, and Langhor Park, and ending at W. Kagy Ave. The section of the path near the Public Library passes through an outdoor sculpture garden. An out and back is 3.5 miles. LOOP Options. Easy to vary the run to make a loop. For a pretty run on pleasant residential streets, head back north on S. 3rd Ave. or any of the other paralleling streets, to Main St. Use S. 7th or S. 11th to pass through the pretty MSU campus. There are also numerous add-on options and loop variations. Peet’s Hill/Bozeman Trail. Just off the Gallagator Trail near the Library is Peet’s Hill. Do the short climb and then run south along the Bozeman Trail, which is pretty trail that sits above the Gallagator. Really pretty at sunset! Our route. Gallagator Extension. The trail now extends across W. Kagy Ave. and continues for 0.5 miles. Can continue even further south along a more rugged trail paralleling Middle Creek Ditch. Running Track. Just across W. Kagy at MSU’s Bobcat Track and Field complex. Sourdough Trail. Cross W. Kagy to 3rd Ave., then LEFT (east) on Westbridge Dr. to Grafs Park.